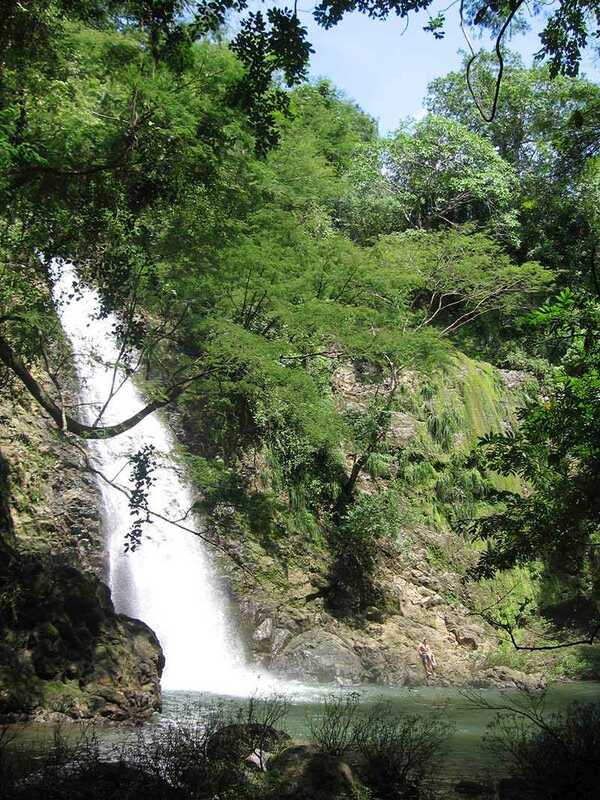 Amazing Montezuma Falls is just next to the resort – in fact is only a five minute walk from Anamaya. Behind the Bali Cabina you’ll find a gate, and the path starts at the other side. This is a tropical waterfall, which means the water is very warm and refreshing, not the cold type river you’re probably used to back home. The pool is over twenty feet deep, and is ringed by small cliffs 10-15 feet high, and you can jump into the pool from anywhere on the cliff. On the bottom side of the pool, it drops into the second pool, which is 35 feet down. Many people have been hurt jumping the second falls, so we don’t recommend it unless you have a lot of experience with this type of cliff jumping. This is quite a long drop and less than half of the people will jump it. From there is an even higher waterfall, and jumping that one is pretty crazy, not done by many people. 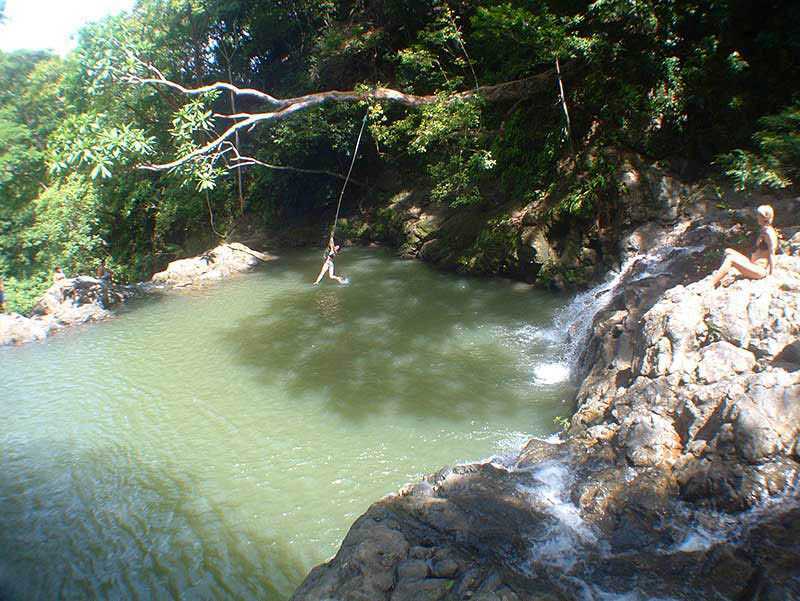 At the pool closest to us, is also a rope-swing which is fun to use to launch yourself like Tarzan into the water. 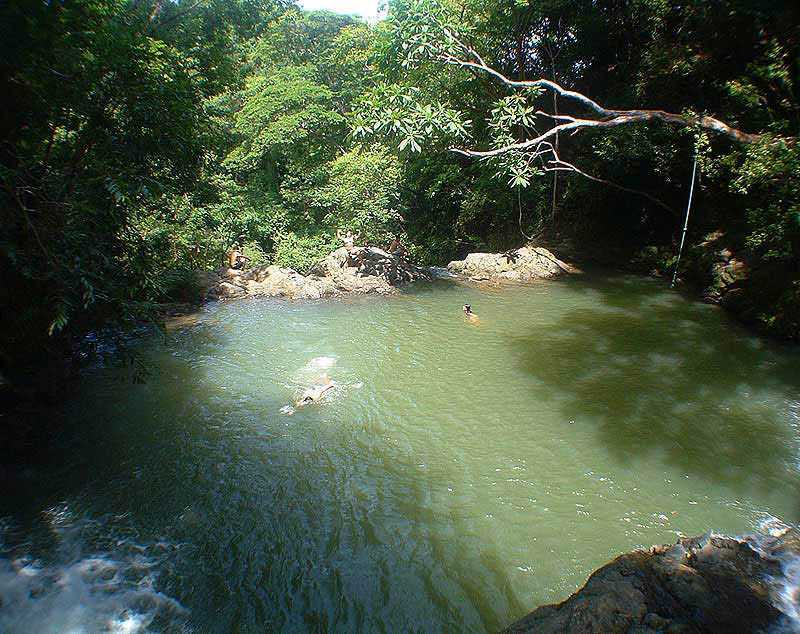 From this pool is also one of the best hikes in the Southern Nicoya Peninsula. You can head upstream for an hour or so and will find many small waterfalls and pools of all shapes and sizes. We highly recommend this adventurous experience! 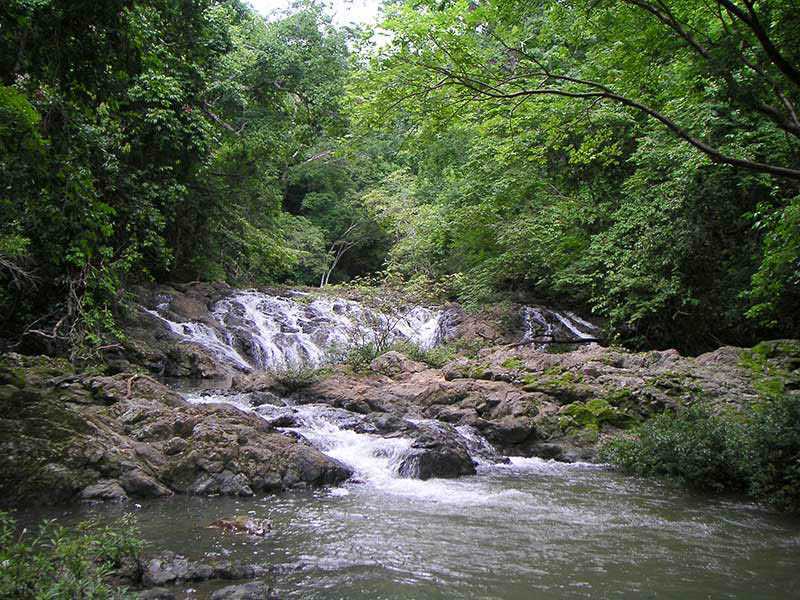 Once a week we offer a guided tour of the waterfalls, and our guide will teach you all about the area’s nature and show you the best spots around the three waterfalls. More about this waterfall and the area’s other waterfalls can be found here. The bottom, largest fools is over 60 feet high and has a huge pool for swimming below it. This is where most of the tourists go, walking up from town below. 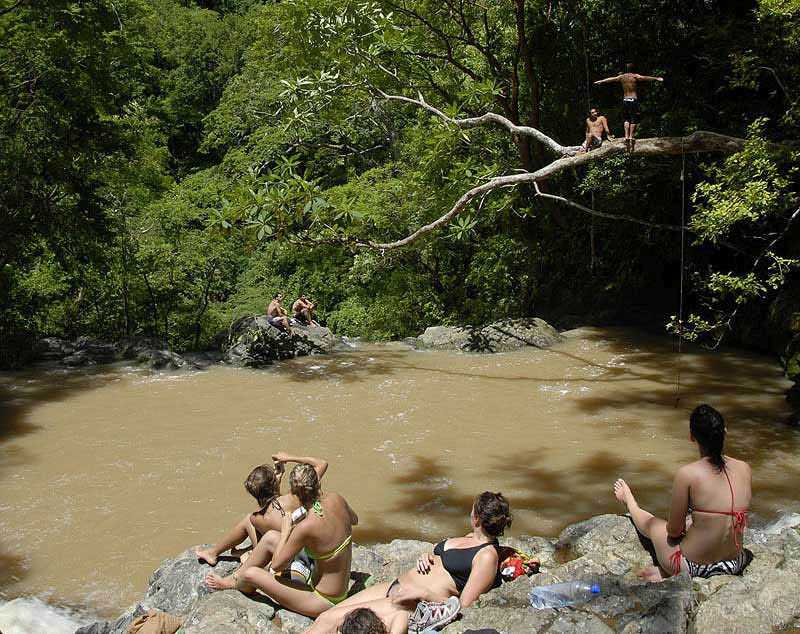 The upper-most pool is a five-minute walk down a path from Anamaya, and has a rope swing that’s tons of fun to try. 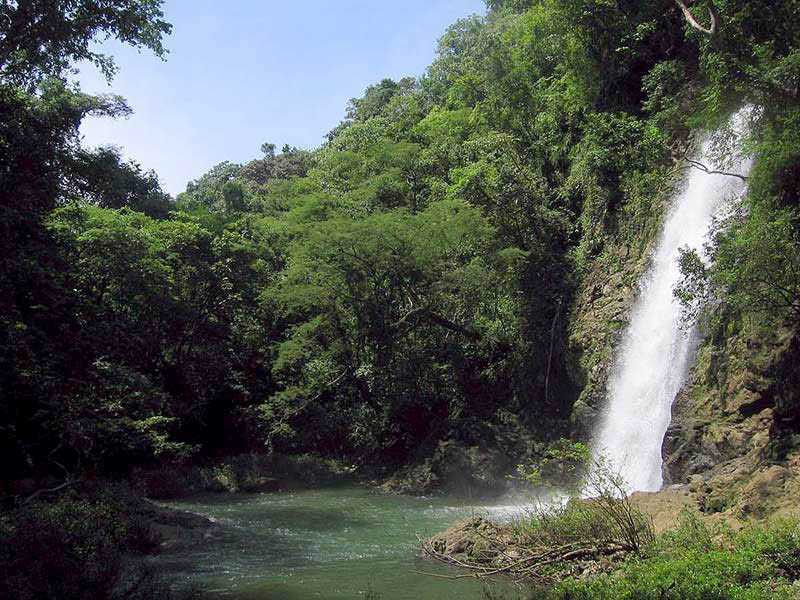 Montezuma Falls is a classic, large tropical waterfall with warm water, and runs clear most of the time. You can climb behind this waterfall from the left side, then leap through it into the pool below. It’s a fantastic experience that most of our guests at Anamaya have to try. This is what the pool looks like if there was rain the day before. Runoff from the hills around Montezuma and Delicias clouds up the river for a day or so if it rains hard enough. The river just above the third pool is one of the most beautiful hikes in the area. It takes about an hour or so to walk up and see most of the best stretches of this beautiful tropical gorge. Another photo of the hike up the river from the waterfall. Highly recommended.